Milford parts painted blue. 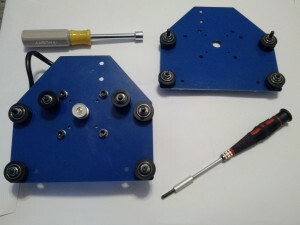 Worked through the first few steps of the construction process and found a few parts missing for the Z-axis. A blessing in disguise, it allows me to enjoy the construction process a bit longer. The drive pulley was tight on the motor shaft. Before forcing it onto the shaft, which experience tells me is a really bad idea, I used a bit of sanding cloth on the motor shaft until the pulley slipped onto the shaft smoothly. Nice. I like it better blue than gray.